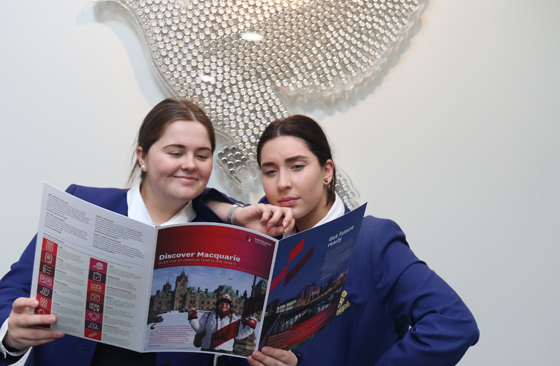 Congratulations to Tiana Kovac and Phillipa Rich who have both successfully secured a position in the GLEP Early Entry program at Macquarie University. Both Tiana and Phillipa will study Arts Law next year. Each year a small cohort of girls sit the UMAT exam. This exam is the first step on the path to Medicine and other health related courses. Students have been preparing for this exam for many months and we wish them well for next Wednesday. This term is a busy one in the Careers Office as Year 12 begin to make some firm decisions about courses, pathways and options for 2018 and beyond. Below are three important schemes that all girls – and their parents – need to be aware of. For further information, please don’t hesitate to call or email the careers office. The Education Access Scheme or EAS is a scheme for Year 12 students who have had their educational performance seriously affected, due to circumstances beyond their control or choosing, normally for a period of at least six months, during Year 11 and/or Year 12. To successfully manage the applications, if you are applying and/or would like some further information, please come to the Careers Office to discuss. The School Recommendation Scheme (SRS) is an early offer program, managed through UAC. A number of universities are part of this scheme, but not all courses are offered. SRS is open to ALL students. Equity Scholarships help financially disadvantaged students with the general costs associated with tertiary study. Equity Scholarships are awarded to students from low socio-economic backgrounds, particularly those who receive Centrelink income support payments such as ABSTUDY, Austudy, Youth Allowance, Newstart Allowance, Disability Support Pension, Parenting Payment (Single) or the Carer Payment. ANU is hosting a Mid-Year Advisory Session, which is being held on Wednesday 26 July at the Portside Conference Centre, Kent Street, approximately 4-5 minutes’ walk from Wynyard Station. This is a fantastic opportunity for students to have their questions answered in a one-on-one setting. There will be staff from most of our academic colleges, as well as our admissions, accommodation and global programs divisions. Students should register for the event using Eventbrite here. Applications are open now for the 2018 Apprenticeships Intake. The NSW Surveying Taskforce has a new website. Students can watch videos about work experience, tertiary studies and working in surveying. Plus, find out about the reasons why people have chosen surveying as their career, and the work they do on a day-to-day basis. Students can register for a work experience placement, and find out pathways into Surveying. Experience the life of a student at Ella Baché College. At Open Day, you will tour the campus, meet our trainers and learn where a career in the beauty or IPL and laser industry can take you. Delivered jointly by the University of Newcastle and University of New England and supported by the Central Coast Local Health District and the Hunter New England Local Health District. The program uses state-of-the-art education technology and gives you hands-on experience throughout your medical degree. Over 3000 people apply for 170 places each year. The University is throwing open the doors of NeW Space and inviting the community in to explore. Catch a talk from the animator who has grabbed Justin Timberlake’s attention, be part of the action in a mock court room trial, and hear from the creators and builders who have delivered NeW Space. For the family, Newcastle Art Gallery is hosting their Art Cart activities from 10am to 12noon. CSU holds parent information evenings giving parents the opportunity to find out more about your child getting in to university, getting help with costs, and all the benefits that come from study and life at CSU. The Universities Admissions Centre (UAC) will also be presenting at a number of these events and explaining things such as the ATAR and how it is calculated, as well as the university preference system. Come to an information session and find out about the hundreds of roles available to women through the ADF. No matter which service you join, as an Engineer in the Australian Defence Force you’ll work with some of the world’s most advanced technology. 14-17 January 2018. Applications close 30 September 2017. Our four-day summer STEM Camp provides high school students entering Years 10 and 11 in 2018 a fun and hands on STEM (Science, Technology, Engineering, and Mathematics) experience and an exciting introduction to careers in STEM.